Note: Member-sponsored events are hosted by individual members of our community and represent a diverse range of interests. Their appearance here does not imply Sunday Assembly LA's endorsement of or responsibility for member-sponsored events. Therapeutic Full Chest-Breast Massage For Women & Men; Fully Clothed, Community Gathering Workshop! Free (donations accepted). Open/release your Breast-Chest/ heart area, & keep it open so you can embrace & LIVE all life has to offer. Not sexual/sensual. Join Sunday Assembly friends on an outing to Celebrate Your Body & positive BODY Activism! : Learn it & Pass it on! No passive listening to lecture; completely participatory from the beginning. A practical class in a fun, playful community gathering setting, which focuses on learning simple, massage techniques created for specifically this area of the body, & taught without technical language so non-practitioners can learn this as easily as CMTs, & *everyone* can learn to teach these techniques in a way that can be easily & quickly passed on thru our communities. The technique assists in letting go of patterns of muscular holding, moving one thru new patterns of posture & attitudes of breast-chest wellness, to repattern the mind-body connection to healthier patterns of alignment & muscular coordination; & dispel tension/pain, bad posture, inhibited breathing, & poor circulation --for healthier tissue in this area. Lots of focus on supporting each other to enjoy & celebrate your body *always*! A few exercise & fun practices for Breast-chest well being that most people won't be familiar with will also be shared. No experience necessary. Participants need to be willing to give as much as they receive. 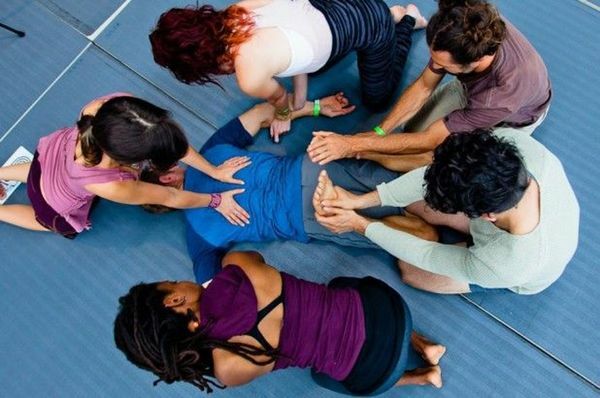 If you drop-in we'll put you where there's space (we work in groups of 4): you may be giving & receiving with either gender or working on a yogamat: To ensure space ***specifically*** on a WOMEN-ONLY, COED, or MEN-ONLY massage table; or alone AS a COUPLE, –you can reserve a space: A $20 contribution to the ongoing fundraiser (which keeps our gatherings free/no-one-turned-away) is appreciated, but not required & can be done at this link: www.whimsyum.net/circles.html ($40 per person requested for couples who want their own table as we otherwise work in groups of 4 people): Reservations can be made up until 10:15am on 4/18: You can say which table group you want to be with either on the note area on paypal, or on 24hr voicemail(does not accept text messages) at (310)936-3150. Breast cancer websites teach self massage, & their walks have practitioners offering breast/chest massage: But many massage therapists still won’t massage this area, & now many physical therapy clinics prohibit therapists working on the front of the torso on men or women; so people are losing the benefits of massage treatment on this part of the body. Hosted by Diana from The WHIMSYUM (…Beyond A Future Studies Institute) as part of a collaboration between the LA Therapeutic Massage Communities Gathering, LA Interactive Kundalini Yoga Community Gathering, & a diverse cross-section of other creative, dance, athletic, mind-body-spirit, & cultural communities & individuals cocreating & Living the future ~*NOW*~; consciously choosing to live by their own rhythms & make their decisions from their heart & spirit rather than letting human lives be limited by mainstream thinking. 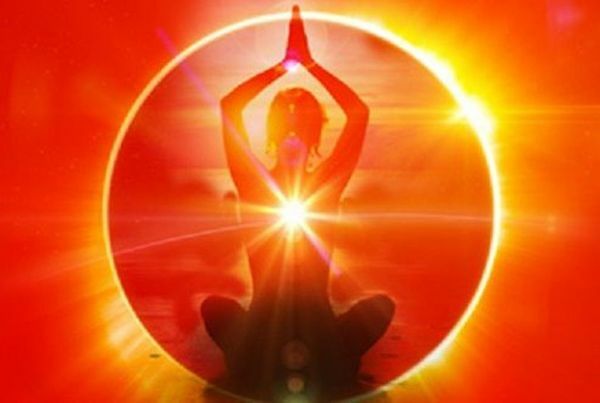 Followed at 3pm by ‘Breast/Chest Wellness’ playshop class hosted by LA INTERACTIVE Kundalini Yoga Community Gathering Playshop: Step Off Your Mat & Try the Social Yoga! Movement, dynamic breathing, using each other's body weight to stretch, & eye-gazing meditation --to music & Tibetan bowls: All sharing a mat with another, continually switching partners; or holding hands/arms physically in contact with the whole group. Fun, playful, very outside-the-box gathering of community. (*** Disclaimer for Sunday Assemblers: Teacher may say some New Age-y/Energetic stuff for a few minutes at beginning of his class & at moments in class, --but there are all kinds of people attending & the teacher invites everyone to experience with their own perspectives & beliefs, & disregard anything he says that doesn't work for you: His main focus is to encourage people to focus on the positive (some days he just reads funny poems focusing on the point of view of a dog :) People coming for the physical, community, & the positive attitude make up the majority***). Both workshops Free but box set at side of gathering & donations accepted from those it's not a financial issue to who'd like to help pay for our rentals, website fees & the Kundalini Yoga teacher. I host the Therapeutic Massage gathering free, each month, to build touch-positive, outside the box community. Usually I don't accept donations for the massage gathering, this month is an exception, for the 'breast' theme --so that we could rent a place that we knew would be supportive to the theme, & I could promise to reserve gender-specific table space to those who need it to be comfortable. Usually all the therapeutic massage gatherings are outdoors in the warm season, I rely on the community to bring tables, & no donation box is put out.